In this lesson we will see how to create a navigation bar which will allow us to navigate between the cards in our stack. First create a new stack. 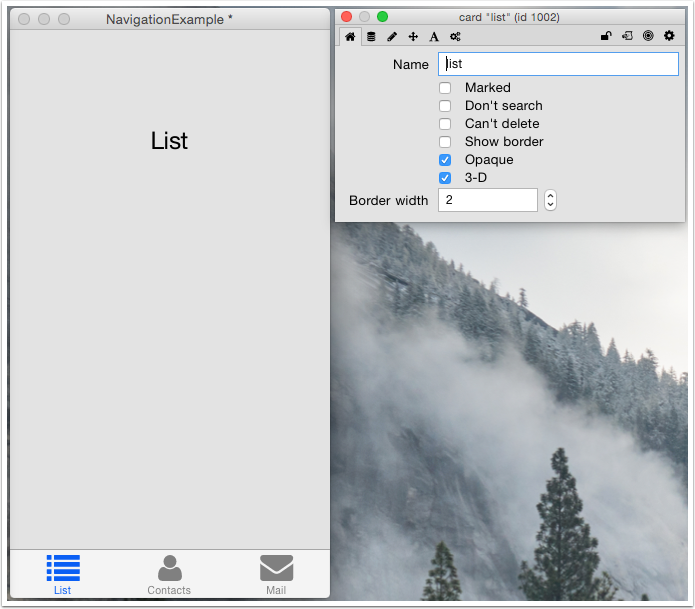 Open the Stack Insector and set the name to "NavigationExample"
Drag on on Navigation Bar widget and place it at the bottom of the card. 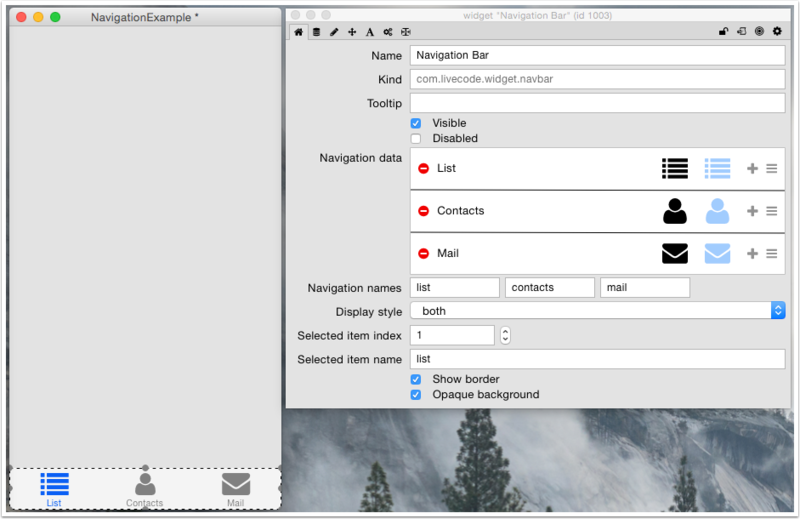 Open the Property Inspector for the Naviagtion Bar and set up the Navigation data and Navigation names. We wil have 3 items in the Navigation Bar: List, Contacts and Mail. A background group allows a control to be shared between cards. Because the Navigation Bar will appear on all the cards in the app and is used to show the user which card they are on sharing the widget across the cards is the best solution. It reduces the amount of code you need to write and the number of controls you need to create. 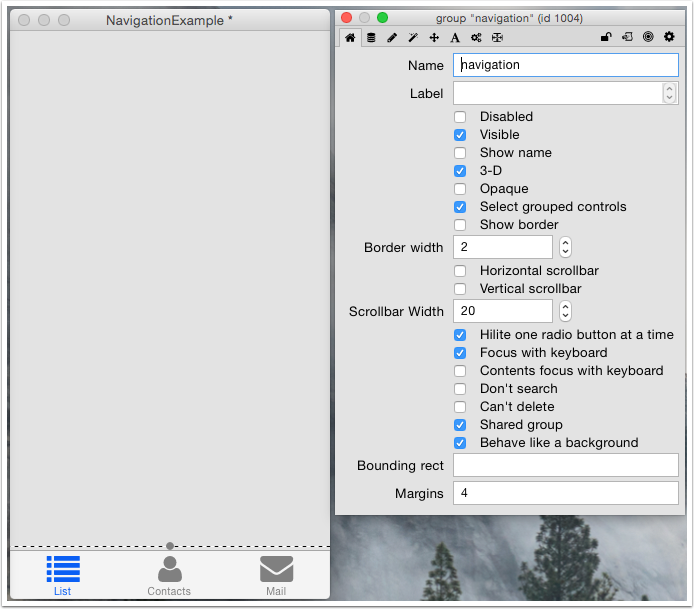 Set the name to "navigation"
Background groups are automatically placed on new cards. Out app will have 3 cards, to match the items in the navigation bar. We need to set the name of each card so we can refer to them easily in our code. We'll start by setting up the first card. Set the name to "list"
Set the contents to "List"
Set the name to "contacts"
Set the contents to "Contacts"
The final step is to add code so the navigation bar switches cards when the user selects an item. 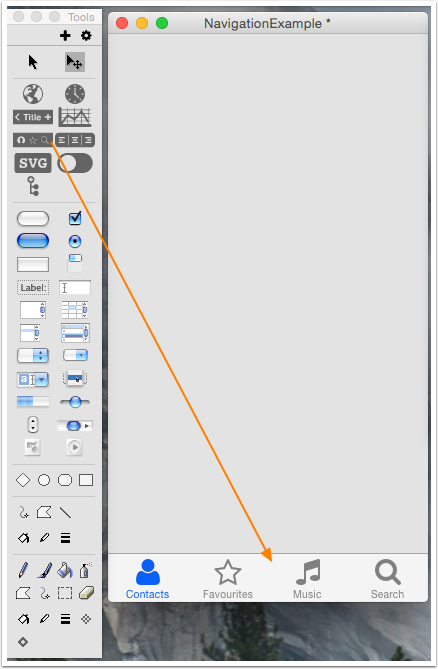 Select the navigation bar widget, you might need to select Select Grouped in the Menbar to allow you to select the widget and not the group. 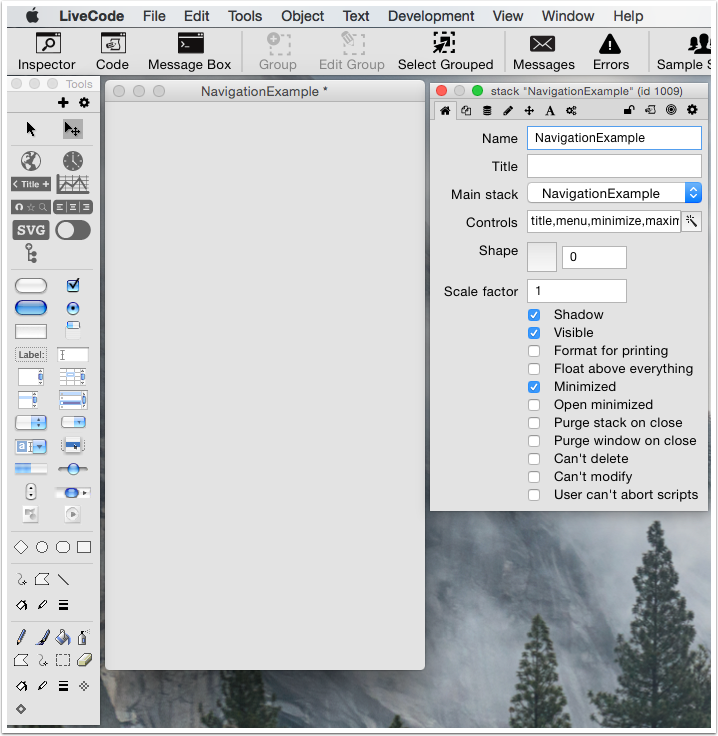 Open the Code Editor for the navigation bar widget. You will see that the widget had a default hiliteChanged message. The hilitedItemName property returns the item name of the selected item. Becuase the names of our cards match the item names of the navigation bar you can use this property to navigate to the correct card. Switch to Run mode and test the stack. Hello everybody thanks for the helpful Tutorial. I have a Question regarding the Icons you can use in the navigation data. I can choose different icons from the list but I'm wondering if I can use my own Icons, I made myself? At the moment you can't do this but there is an enhancement request in our database. You can add your email address to the CC list to receive updates when the status of the bug changes.